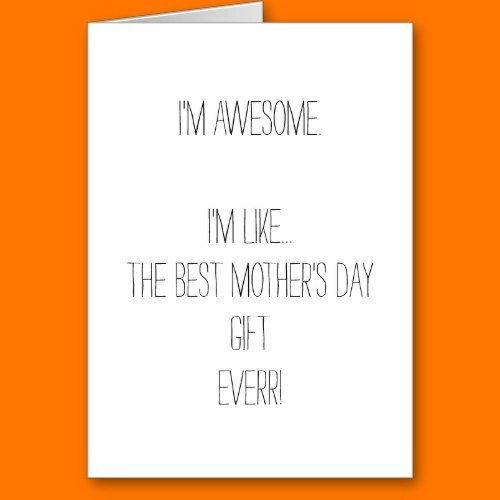 I'm awesome... happy mothers day to the luckiest mom! "I'm Awesome. I'm Like... The Best Mother's Day Gift Everr!" (and on the inside it says..) "You're Welcome. Happy Mother's Day To The Luckiest Mom!" A crazily funny, insane, hilarious, fun, mothers day card. A very thoughtful, lovely mothers day card - in terms of sensitivity, love, admiration, adoration, this card is unbeatable. A great card to show your appreciation, Yessiree! A funny, humorous card for mom, that you may personalize for mother's day, birthday, christmas, and more.